Of course, successful bodybuilding is the sum of many parts, but, if there were to be one single aspect which will halt your progress point blank quicker than any other, that would be diet. Without a good muscle building diet you can kiss any ideas of a great physique goodbye. For instance, many have muddled through with less-than-perfect technique, unorthodox workouts, and even sub-par exercises – even doing 5-6 and 7 day-a-week workouts and have made improvements to their physique, but, without a good diet, there simply is no way to build the muscle. Now we’ve established how important diet is, let’s take a look at 5 of the key muscle building diet tips that, if followed, will get you off to a good start. 1. Eat more than your body needs. Some don’t count calories at all, instead counting portions, while others know exactly how many calories they need. This isn’t something any BMR calculation can tell you point blank, those are only estimations, ideas. My suggestion is to first of all count how many calories you are already eating on a daily basis. If you’ve managed to stay at the same weight for a while, that means the calories you’ve been consuming is an accurate assessment of your maintenance level. You must consistently eat above you maintenance level (try 250-500 calories a day above) to grow muscle. 2. Have the ‘correct’ ratio of macronutrients make up your total calories. First of all, I emphasize correct because really, there is no correct, magical formula. Much of it comes down to personal preference or knowing which your body works best on. Higher protein intake is shown to increase and maximise muscle growth, and help to keep the body in a positive nitrogen balance, so many opt for having 1-2grams of protein per pound of bodyweight per day. So, if that’s the case, you have 2 other macronutrients, carbohydrates and fats, to make up the remainder of your overall calories. Next up is carbohydrates. Forget simple carbohydrates. More or less, they are absorbed straight away into the bloodstream as a ready source of energy, and if they aren’t burned quickly – as in, 20 minutes on the exercise bike, quickly – then you are going to see them turn to fat. Go for complex carbs. Things like potatoes, pasta, and brown rice. These digest much slower, giving you more time to burn them off, and leaving less potential for them to be stored as fat. Don’t be frightened of having high fat in your diet. Healthy fats, such as fish oil and dietary fats are good. High fat when building muscle helps to boost testosterone, and won’t make you fat – quite the contrary: high testosterone helps to burn fat. So, with the macronutrients mentioned, a good split could be 50% protein, 25% carbs, and 25% fats, making up the total amount of calories you need to grow. 3. Eat little, but often. 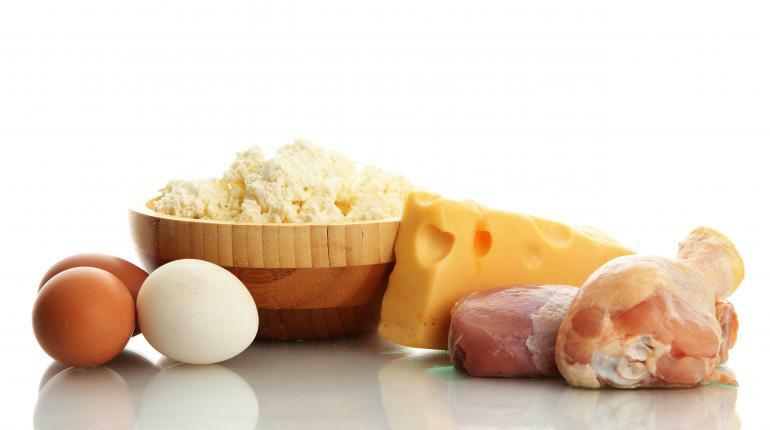 A big mistake many make when trying to build muscle is going too long without food, particularly protein. When muscles are broken down and are trying to repair, they need regular protein to maintain the positive nitrogen balance. That’s why many take to protein shakes, for convenience. Eating every 3 hours is a good idea. Small amounts, rather than big ones are all that is needed. Simply ensure you get around 6 small meals a day, all including a good amount of protein, and you’ll be fine on that score. 4. Carbs pre-and-post workout is recommended. Because carbs are the first thing to be used by the body for energy, that means, a high carb diet will put you at increased risk of putting fat on unless the carbs are burned off quickly. That’s why it’s not so much of a good idea to eat high carbs all day long. Rather, eat a good amount of carbs pre-workout, to fuel your workout, and also a good amount after, to help you to recover glycogen stores and aid in muscle recovery. Those two meals, then, should make up the bulk of your overall carb ratio for the day. Avoiding carbs before bed is also a must, because you simply don’t burn much energy at all during sleep, so having high amounts of carbs in your system will simply put you at increased risk of becoming fat. 5. Have a weekly cheat meal. Of course, ‘cheating’ makes you sound like a naughty schoolboy. But, the best results come from absolute dedication. Unfortunately, most of us aren’t robots, and we do want rewarding from time to time – and cheat meals are just the reward. Think about it: you’ve ate well all week long, food which you don’t particularly enjoy as much as your favourites… so… where’s the harm in replacing a meal or two for that day for a nice pizza? Doing this will remind you that what you are doing is a good thing, and keep you focussed and on the ball preventing you from becoming bored and disillusioned with your diet.